A few images will not display correctly, but fixing them is simple. They just need to be re-uploaded. Click on direct image link. In the example to the right, this is "ZipZap_OldSchool.png". Save this image to your computer. Click on the "Upload a new version of this file" link on the image description page. Browse to the location that you saved the image and re-upload the file, making sure to click the "Save file" button when the upload warning appears. I've looked through Special:Newimages until 20050715203537 (or there abouts) and found the following. (The broken ones will appear as this image.) Feel free to pick up where I left off. - it's not passing the parameters correctly to the function. The showTocToggle function uses document.write() - in the age of DOM this is almost a capital offence for a site that tries to be standards compliant. The showTocToggle function checks that the DOM functions exist and bails out of they don't. This makes the previous point even worse because it shows the writer knew about DOM. But then it fails to use them at all in the script. This is mibluvr13 here and I can't seem to log in. I kept typing mibluvr13, but it acted like there was no such username. So I put my password in twice and my email and made a "new" username, which showed up as Mibluvr13. Help? This is computerdude33. I'm having the exact same "no username found" error. All links to videlectrix games result in a 404'd page. This happened to me on several cheat commandos links, any help? I checked into the page I got it from, Commandos in the Classroom, and part of that is black too. it wont log me on! ive tryed it over and over agen with no luck im djm1791 plese help! from within function "MediaWikiBagOStuff:_doquery". MySQL returned error "1062: Duplicate entry 'hrwiki_mwiki6:messages:Bad_image_list' for key 1 (localhost)". Note that this is based on MediaWiki 1.4.5, but it should be quite similar in 1.5.x. Argh! The same thing is happening to me! I can't remove my talk page from my watchlist because it says that I have no items on my watchlist. But I know it has to be on my watchlist because the page title is in bold on Recent Changes. I just can't see to get rid of the banner or remove the page from the watch list! Please reply ASAP! PS: I tried adding this page to the watchlist and both this page AND User talk:The Chort have turned up. I can remove this page but not the talk page! Stupid Wiki! PPS: It's gone! HOORAY! Please ignore everything above this line. What should happen is that it detects whether the section you were editing has changed. If not, it merges your changes into the article, regardless of any other edits. 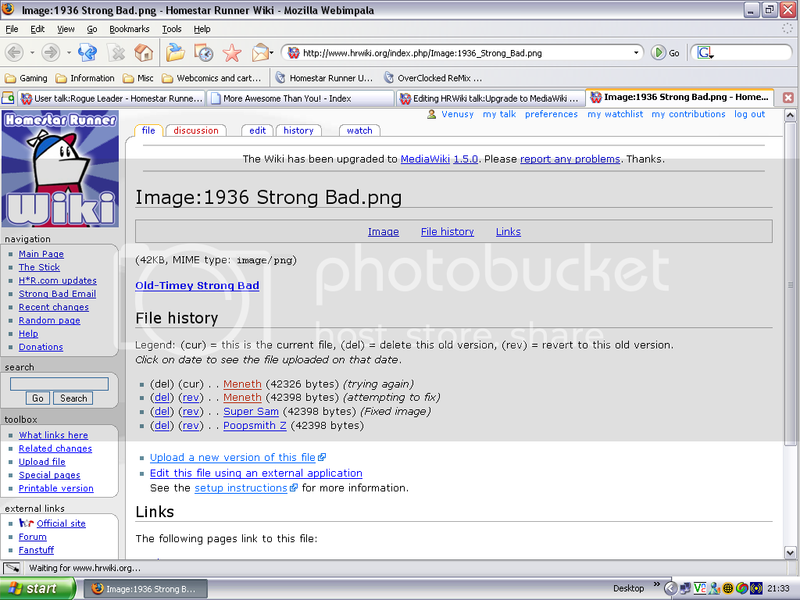 This page was last modified on 20 April 2007, at 22:44. This page has been accessed 49,260 times.